What disgusted the great poet in 14th-century Florence - money-grubbing hucksters masquerading as men of G0D - is just as disgusting in 21st-century America. 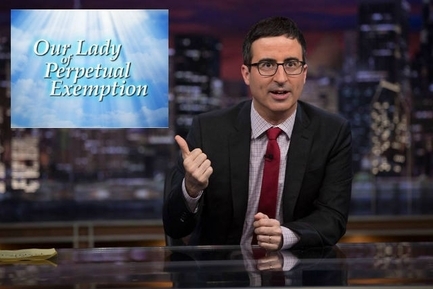 Comedian John Oliver is no Dante, but on his HBO program "Last Week Tonight" he recently ripped into the "prosperity gospel" of television preachers like Robert Tilton and Creflo Dollar, who aggressively solicit donations to finance lavish lifestyles. These sleazy televangelists, Oliver said, assure followers that "wealth is a sign of G0D's favor, and donations will result in wealth coming back to you." They call it "seed faith"  the belief "that donations are seeds that you will one day get to harvest." And the more believers "seed," the more G0D will reward them with riches and miracles. The conviction that charity returns blessings to the giver has been a pillar of Judeo-Christian teaching for millennia, of course. The Hebrew prophet Malachi urged people to put G0D to the test by tithing unstintingly. Be generous in giving to the poor, he quotes G0D as saying, "and see if I do not open the floodgates of heaven for you, and pour down upon you blessing without measure." In the Sermon on the Plain, Jesus exhorts his followers: "Do good, and lend, expecting nothing in return; and your reward will be great. . . . Give, and it will be given to you." How can anyone not be appalled by such swindlers? They pervert what is most beautiful and ennobling about religion to prey on the weak and gullible, and in so doing bring G0D's name into contempt. What seems to most infuriate Oliver, however, is that these television "ministries" are tax-exempt. He rails against the IRS for treating them as legitimate, and mocks the agency's disclaimer that it "makes no attempt to evaluate the content of whatever doctrine a particular organization claims is religious," as long as the beliefs are "sincerely held." To prove how meaningless a standard that is, Oliver even set up his own "church"  Our Lady of Perpetual Exemption  and invited viewers to send him tax-deductible donations. Obviously, he isn't the first person to discover some shepherds are interested only in fleecing their flock. The Senate Finance Committee investigated six leading televangelists in 2007. The Dallas-based Trinity Foundation has been investigating religious fraud since the 1970s. Scandals involving TV ministries have often drawn media coverage. HBO's comedian/host John Oliver set up his own "church"  complete with a website soliciting tax-deductible donations. But federal law purposely makes it difficult for the IRS to investigate churches. This is not because Congress wants to encourage charlatans who exploit people's faith to line their own pockets, but because of the longstanding American aversion to giving government the authority to pick and choose among faiths, or to distinguish sincere religious beliefs from insincere scams. In a report last month, the General Accountability Office concluded that the IRS lacked the internal controls to guard against the temptation to "select organizations for examination in an unfair manner  for example, based on an organization's religious, educational, political, or other views." It is a bedrock principle of American life that discerning religious truth is no job for the state. Sleazeball televangelists deserve to be mocked and exposed and warned against  but not by the IRS. As the First Amendment secures John Oliver's right to excoriate Creflo Dollar, it secures Dollar's freedom to preach his gospel of greed. That's a reasonable tradeoff in this imperfect world. As for the world to come, consult Dante.